On 14th of November, Spain, Portugal, Cyprus and Malta are going on strike. Greece and Italy will follow just days later. This transnational action in southern Europe breaks borders – not only in a geographical sense. It is an attempt to overcome a weakness of previous struggles: their separation from one another. We're glad to see, that the movements, the many individuals, the declassified and outraged of southern Europe want to make the next step. 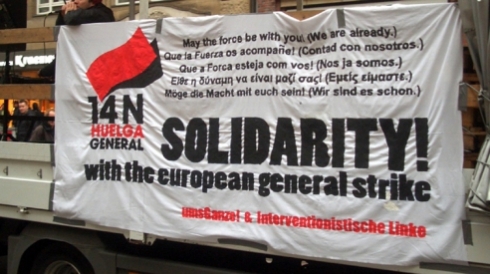 Even if we are not yet able to contribute much: we declare our solidarity with Europe's first transnational general strike! Together against Troika and ECB, against the chauvinist crisis command of the EU and its German sponsor and beneficiaries! Against the reactionary phantasm of nationalist politics and the racist distortion of our commonalities! Since the summer of this year, when German government officials travel to capital cities in southern Europe, it is a trip into a state of emergency. Whole districts of Athens had to be secured by paramilitaries. The outrage and contempt of the people are so militant that all direct contact is prevented. In contrast, German cities are still a safe place for the capital's entourage – except for brief interruptions. In spring 2012 the European action day M31 and Blockupy Frankfurt were at least able to partially break the silence, at the same time leading to a massive panic within the security regime. For four days, the city was held captive by the robocops of state power – a slight taste of Greek settings here in Frankfurt/Main. Now, we are excited for the strikes of November! For a radical left in Germany this means continuing to interrupt the state-supported discourse and to open up spaces for European protests against crisis here. This is no small goal. To be successful we must connect our own initiatives with those of many others. Such commonality in difference is created in movement that brings courage and opens perspectives. Together with many other radical left groups and activists, ...ums Ganze! and interventionistische Linke have contributed to the action days in March and May 2012. Although starting a promising process there were substantial limits of both mobilizations. But, the fact that there will be no strike efforts here in Germany is only to a little part a consequence of our disabilities. If it's not possible to crack the national corporatism of unions and society, solidarity with the struggles along the European periphery will be nothing more than an occasional disturbance. So we are trying to make the next step. Solidarity with those hundreds of thousands protesting in the streets of Athens, Madrid, Lisbon and Rome means for us – like them – trying to bring the strike into the metropolis: in order to connect the resistance against exploitation of labor with those against the capitalization of the public space, in order to interrupt the madness of this daily business as usual. The movements of southern Europe have learned - and we are learning too - to struggle locally and transnationally connected at the same time. Intervene, everything is at stake. We will do as we suggest: transnational solidarity in anticapitalist practice. The encounters in Thessaloniki and Madrid were a good starting point. More will follow. Let's overflow the spaces of the Europe of Capital - Let's rupture its state of emergency and its normal execution. The massive strikes of November 14 and 16 open a horizon in which it will be worth the struggle. In that sense, we add a question mark to whether the new ECB building will open in Frankfurt 2014.